How to make Soft Idli ? Idli is a healthy, oil-free, traditional South Indian breakfast. Rice is staple grain of South India. Idli is prepared with Rice and Urad dal. Idli is also called as Rice Cake. The secret behind soft Idli lies in making of Idli batter. Idli batter prepared with right ingredients, grinded to soft texture with enough water and proper fermentation plays a key role in making soft Idli. 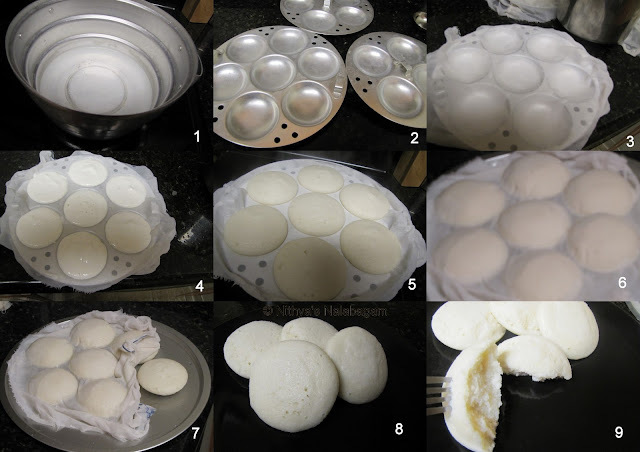 Please check below for step by step instructions and pictures for preparing South Indian traditional breakfast Idli. Use Idli vessel for preparing Idli instead of using cooker. Cover the Idli plates with white damp cotton cloth. This helps in keeping Idli soft even hours after cooking. (Picture 3). If there is no cloth, then lightly coat idli plates with oil or cooking spray.